It’s always good to have a good quality set of luggage for when you travel whether for vacations or regular travel for business. If you travel for work or take regular vacations, you will have the need for a good set of luggage to take your belongings with you. There are endless choices when it comes to luggage so choosing the set that you want can be a real challenge. These top rated luggage sets are customer favorites and we’ll share their features and benefits with you so you can see if they work for your needs as well. Luggage comes in all shapes, sizes colors and price points. The choices are endless and that can be a real issue when it comes time to find a set you want to purchase. The top rated luggage choices we have reviewed are great choices if you are in the market for some. We will give you detailed information about each of these top picks and provide you with additional information about choosing the right set of luggage for your specific needs. Even if you don’t travel often it’s a good idea to have a set of luggage for when you need it. You never know when you might have the need for that luggage and you’ll be glad that you have it. US Travelers provides people with an excellent, high quality set of luggage that is built to be functional and last through multiple trips, even those that travel for a living. Made from 30% dobby fabric and 70% polyester and can be spot cleaned when necessary. There are 4 pieces in this set, each one a different size to help accommodate the circumstances. Some trips you will need all of the luggage and others you may need only a couple of the bags. That is the great thing about a set that has several sizes. Thanks to the special add-a bag strap, you can carry another bag easily. The different pieces of luggage have light gray interior lining and tie down straps to keep everything nice and neat during travel. There are also interior zippered mesh pockets and dual shoe pockets too. The retractable handle operates with a push button and the inline skate wheels make pulling the luggage smooth and easy. Along with all of the other features, there are multiple zippered pockets on the front of the pieces for things like travel documents and magazines and also carry handles on the top and sides to make lifting the luggage much easier to manage. 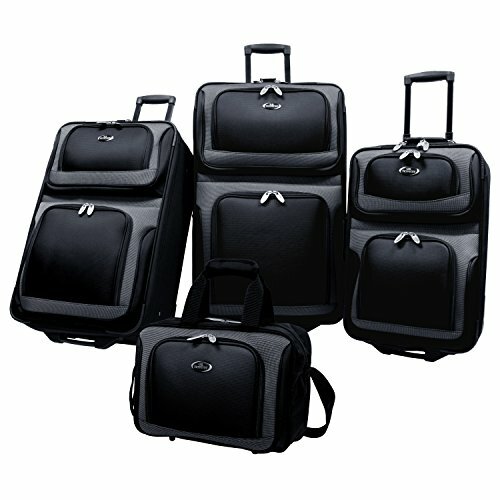 If you do a lot of travel for business, this 5 piece spinner set from American Flyer will provide all the luggage you need on those trips. All of the upright bags feature a retractable telescoping handle that locks and the top, side and bottom handles on the luggage make carrying or lifting the luggage much easier and more manageable. The larger bags have 4 spinner wheels which make pulling it through the airport super easy. The bags are lightweight. 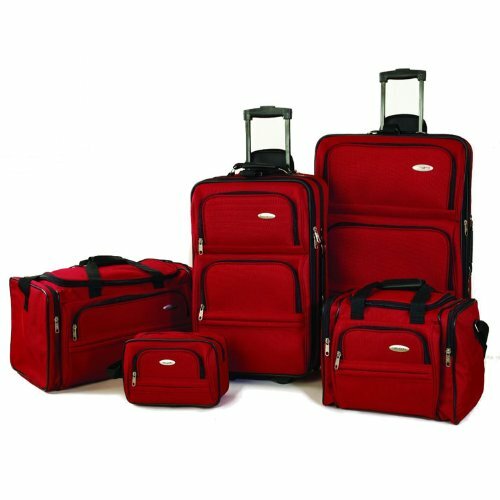 Included in this terrific 5 piece set are 1 – 28” upright, 1-24” upright, 1- 20” carry on upright, and 2 personal bags. Each piece is made of 600 denier polyester for durability and there are several different color patterns available as well. This Samsonite 5 piece travel set contains everything you need to travel comfortably and carry the belongings you need with you, including toiletries. The set includes a boarding tote, duffel bag, 22” wheeled carry-on, 26” wheeled packing case and a toiletry case. The durable exterior of this luggage set is made of 1200 denier polyester and the interior is fully lined. If you travel a lot this set is perfect because you can change up the bags you carry bases on the size of the trip you are taking. You won’t need any other luggage set than this one. Samsonite provides a 10 year warranty on this luggage set for even more peace of mind. There is so much variety in the luggage world with soft and hard sided luggage, different size sets, some that have 2 wheels and 4 wheels, and then there is the huge array of patterns, colors and materials that the luggage is made from. The top rated luggage sets here work for the person that travels a little or a lot. They each are made to last, offer plenty of color choices and have several pieces to accommodate all the belongings you need to bring with you. Continue reading the buyer’s guide below to learn even more about choosing the best luggage for your needs. With the right information and knowledge about luggage sets and what to look for, you will be able to make a decision without worrying that you are choosing something that won’t work for you. If you are in the market for a new luggage set or you are choosing one for the first time, there are several things you will want to consider that will ensure that you choose the perfect set for your needs. Before you start shopping, consider the things we’ve outlined below. Is the luggage going to be used for flying, car trips or cruises? – The kind of travel you will be using the luggage for can be an indicator of the kind you should look for. If you’re mode of travel is flying, you will want to find luggage that is easy to pull through the airports and that has small enough pieces to use as carryon bags if you don’t feel like checking any baggage. If you’re traveling by car, then you want to look for bags that are flexible and pliable enough to make the most of the space you have available in the vehicle. If you’re getting the luggage for cruise ships or you happen to be lucky enough to work on a cruise ship, looking for luggage that stacks easily to maximize space. How will the luggage be stored when not in use? – Where you will put the luggage when you get home is an important factor to consider, especially if storage space is at a premium in your home. Hard sided luggage is much harder to store and requires more room than bags that can stack inside each other or the soft sided varieties that can be flattened a bit when storing them. What size bags do you need? – How long your trips are and how you are traveling will determine the size luggage you need. If the length of your trips vary, you are better off looking for a luggage set that has several different sizes so you can choose the bag sizes you need for each trip. 4 and 5 piece sets, like the top rated sets in this review, have multiple sizes to choose from. Sometimes you may need all of them and other times you may only need one or two. How Much Interior Capacity do You Need? – Outside measurements are important to have if you will be using your luggage when you fly because of the airline restrictions but you also want to determine how much interior space you need. One way to get more interior space is to get luggage with squared corners. Handles and wheels also take up interior space, but these two features are so convenient that eliminating them could cause more headache than having less room would. There are several different types of luggage available to choose from. Some sets only have a specific type of bag and other sets have several different types within the set. Take your personal needs into consideration when you are deciding what type of luggage you want. Carry-on – A carry-on bag is a bag that fits inside the size guidelines to be able to carry it onto the plane with you and place it in the compartments above the seats. The three largest airlines in the industry state that the maximum size for a carry-on bag is 22” x 14” x 9”. Height is measured from the floor to the top, including the wheels. Personal Bag – The personal bag is one that is carried onto the plane with you and is small enough to fit under the seat in front of you on the plane. Personal bags can include briefcases, tote and camera bags, laptop bags and smaller backpacks. One of the best ways to great the most out of your personal bag is to purchase one that is specifically designed for that purpose. Personal bags have compartments for passports, phones, wallets and pens and even have a padded area of your laptop. Checked Size Baggage – Any bag that is larger than what is allowed as a carry on is considered large luggage. These will typically range from over 22” to 30” in height or more. The larger the bag the more it will weigh and the more chances you have for it being too big for the flight. There are many features that you want to look for when it comes to luggage. Below we have listed the most common ones. Decide what type of features you want before you purchase. It will help make your sorting and deciding process much easier. Wheels – There are two different types of wheeled luggage, those with two wheels, called rollers, and those with four wheels, also called spinners. The two wheeled varieties will roll forward and backward only. It is pulled behind you as you walk along. Look for recessed wheels as this will help lower the height of the bag. If you do a lot of city walking while traveling, opt for a two wheeled model because they maneuver sidewalks and uneven terrain much easier. Four wheeled luggage can be pushed but one if the problems with four wheels luggage is there is a danger of the wheels snapping off during the flight. Zippers – You want to make sure that the zippers on your suitcases are durable and as heavy duty as possible. A broken zipper on a piece of luggage is something that can derail your whole trip. There are several types of zippers that may be used for luggage. One is the chain zipper which has two sets of teeth that interlock and is made of metal. The other type is coil, which is not as durable as chain. An YKK zipper is reported to be one of the best available in terms of breakage, and is the most reliable type of zipper to have on your luggage. Handles – All of the wheeled luggage on the market nowadays have retractable handles that go down into the suitcase and telescope up to different heights to pull through the airport. Having a good handle on your bag makes it much easier to get around with. Compartments – Depending on the size and type of luggage it will have any number of compartments for the traveler to utilize. From padded pockets designed for laptops, to zippered pickets for documents, having compartments in your luggage comes in handy. Remember that loading up the outer pockets will take away from the packing space inside. Weight – Look for bags that are lightweight. Heavy bags may FEEL stronger and more durable but that is not always the case. A lighter bag, especially if it is a carry-on bag will be much easier on your back and arms and you’ll mover faster too. Locks – All luggage locks have to be TSA compliant which means the security agent must be able to open your bag if necessary with their universal key. Don’t forget to purchase TSA compliant locks to go on your luggage. Colors and Patterns – There are massive amounts of color choices and patterns available in the luggage world. Whether you want traditional solids in navy, black or tan or you want to express your colorful personality with some of the bright, vivid colors and patterns available, you will be able to find something that you will love having. Warranties – A good, solid warranty is important to take care of any defects that might be present in the luggage. You want to get luggage that has a solid manufacturer’s warranty. The longer the warranty the better it is. Each company will offer its own warranty so just shop around to see what types of warranties are being offered. In some cases, you can purchases extended warranties if the original manufacturer’s warranty isn’t super long. Not every piece of luggage or luggage set will work for every individual. That is one of the reasons manufacturers make so many different styles, types, and colors. With all of those choices available, there is a luggage set for every person, you just may need to do some research to find the set that has everything you want it to. With the information you have learned in this buyer’s guide and the reviews of the top rated luggage choices, you’re armed with the information you need to make an informed choice that you will enjoy using and that will fit your needs well.